TopLife Milk for Kittens is a delicious daily treat for your furry friend made from lactose reduced cows' milk. We've added vitamin C and vitamin E which gives your kitten an extra bit of support during those early weeks and months when their immune system is fragile. Plus, with added Taurine to maintain healthy eyes, and Inulin to nourish the good bacteria in your kitten's digestive system. Kittens love milk but can sometimes have problems digesting cows' milk. Reducing the lactose means it's easier to digest while retaining all the natural goodness and taste of cows' milk. This refreshing treat is a fantastic way to complement your kitten's diet, and gives you the peace of mind that it is also nutritionally beneficial. For younger kittens, our milk is great to help with weaning and to encourage lapping by mixing with solid food or just as a little treat. For older kittens, feed it as often as you like by adding a splash to your pet's dry food or feed on its own as a delicious daily treat. As your kitten grows into an adult, they can grow with us too. 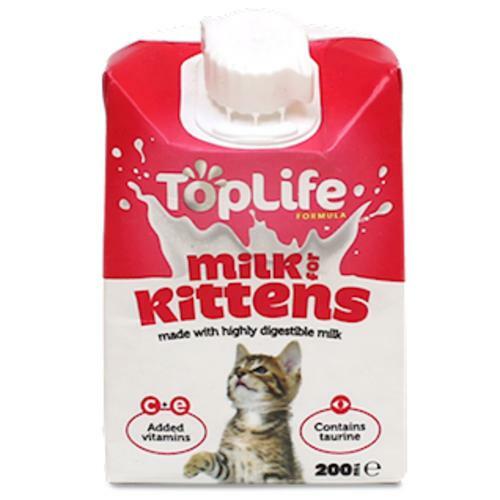 Our delicious TopLife Milk for Cats is suitable for cats aged 12 months and over. Vitamins C & E: To give your kitten an extra bit of support during those first months when their immune system is fragile. Added Taurine: To maintain healthy eyes, and Inulin to nourish the good bacteria in your kitten's digestive system. Helps keep them hydrated: Which can often be difficult in young kittens. Encourages Weaning & Lapping: By adding a splash to your pet's dry food or feed on its own as a delicious daily treat. Recloseable Carton: Once opened, store in the fridge so your kitten can enjoy the milk later.